This women~s tank top takes its cue from the surf styles of Venice Beach, California. Made for warm days, this fitted jersey top features a bright and bold beach-inspired print. 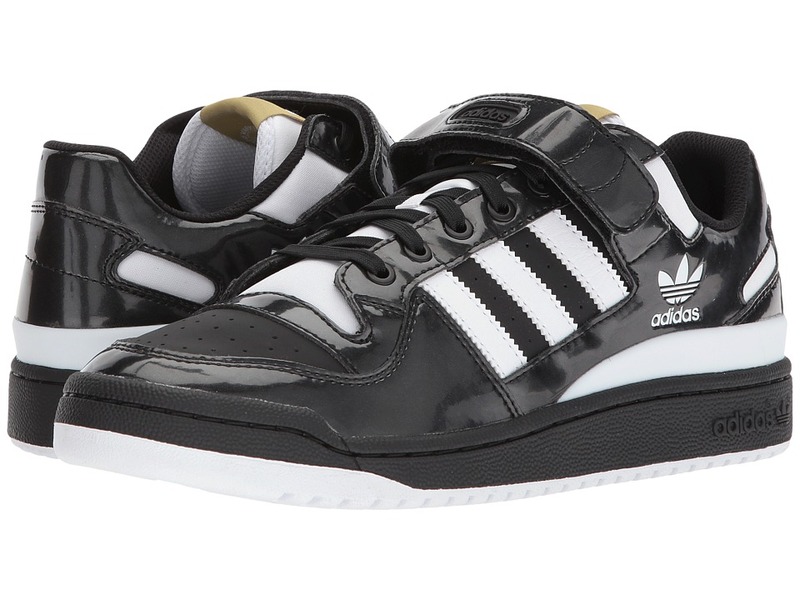 With an adidas Originals graphic on front for an authentic finish. 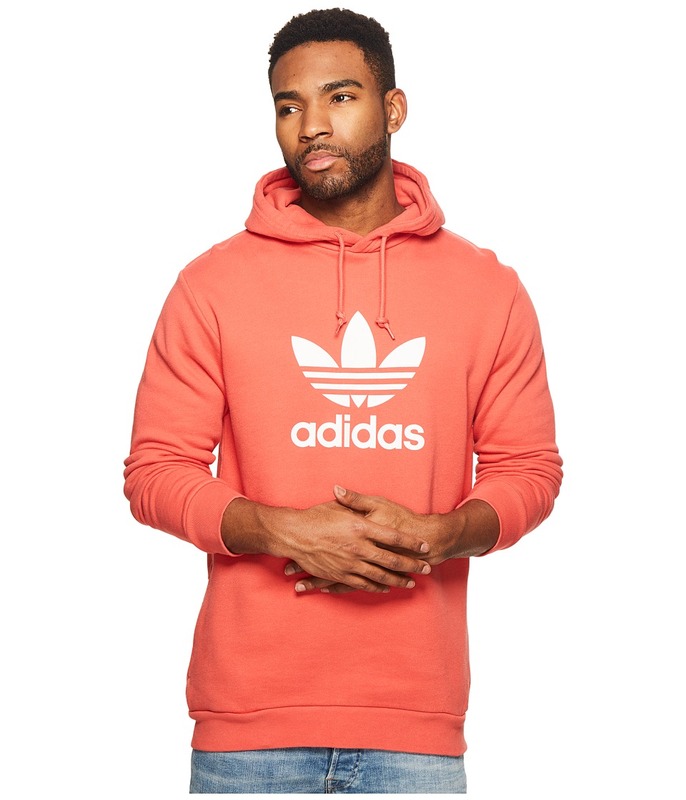 Allover summertime-inspired graphic adidas Originals logo high-density graphic on front 94 percent polyester / 6 percent elastane single jersey. Revamp your shoe collection this summer with Adidas. The Climacool 1 sneaker is the perfect lifestyle shoe featuring a mesh upper and a unique lacing system. The sneaker also offers signature Climacool 1 technology for 360 degrees of cool comfort. Shock absorbing ADIPRENE in the forefoot to provide maximum cushioning. With roots in the original ~90s Equipment running shoes, the new EQT Support ADV series re-imagines the runner-inspired design for today~s urban trendsetter. These shoes have a knit upper with stretch suede and premium leather for an elevated design. A synthetic nubuck overlay adds texture at the toe, while a mesh lining gives them a breathable feel. 3-Stripes extend into the cushioned EVA midsole for a look with both comfort and style. Features a retooled sole that is similar to the classic runner. The upper is made of a mesh material that features a sharper angle than the classic. The Modern Adventure Bike Front brings eye-catching, relaxed moc toe styling and detail to a practical, everyday men~s dress casual shoe perfect for a dressed-down weekend. ADIPRENE by adidas sport technology helps provide all-day comfort. Supple full-grain leather provides flexibility and a stylish punch. adidas Adi Racer Plus Low Soft suede upper in a low-cut driving-inspired athletic casual style with decorative stitching contrasting trim adidas logo and adidas signature side striping embellishment and full lace up front with a lightly padded tongue and collar. 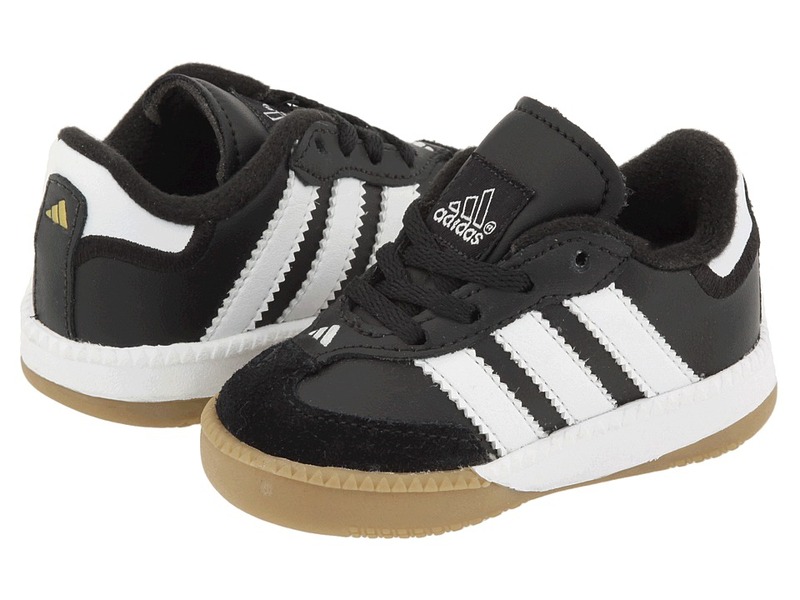 Slightly more athletic than it~s Originals brother&amp#8212with an extended tongue geared for indoor play&amp#8212the Samba Classic from adidas continues to provide that retro vibe in a solid, soccer-ready sneaker! Full grain leather uppers with suede T-toe overlay. Lightly padded collar. 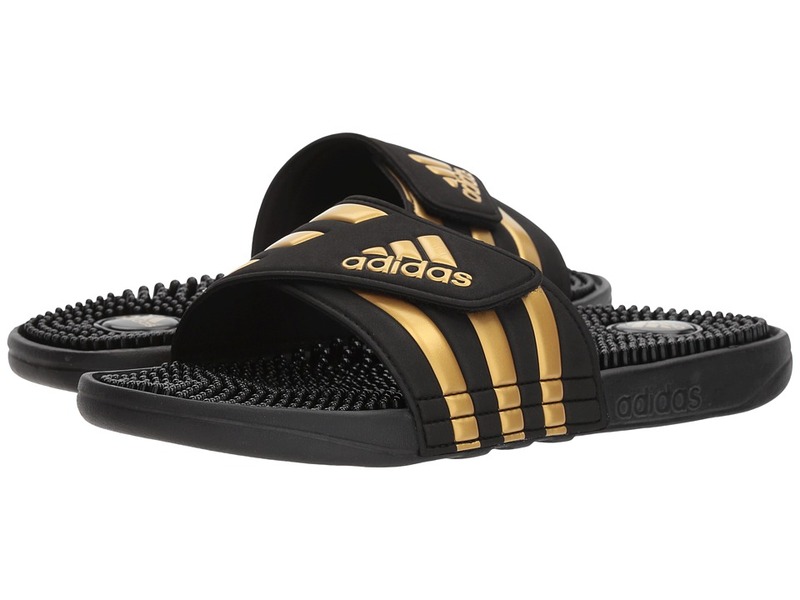 Comfortable fabric lining and lightly cushioned footbed. Traditional lace-up closure with an extended tongue for enhanced ball control and touch. Signature 3-Stripes logo on sides. Gum rubber midsole with serrated foxing detail. Gum rubber outsole for excellent traction. Imported. Measurements: Weight: 12 oz Product measurements were taken using size 6.5, width D - Medium. Please note that measurements may vary by size. Weight of footwear is based on single item, not the pair. 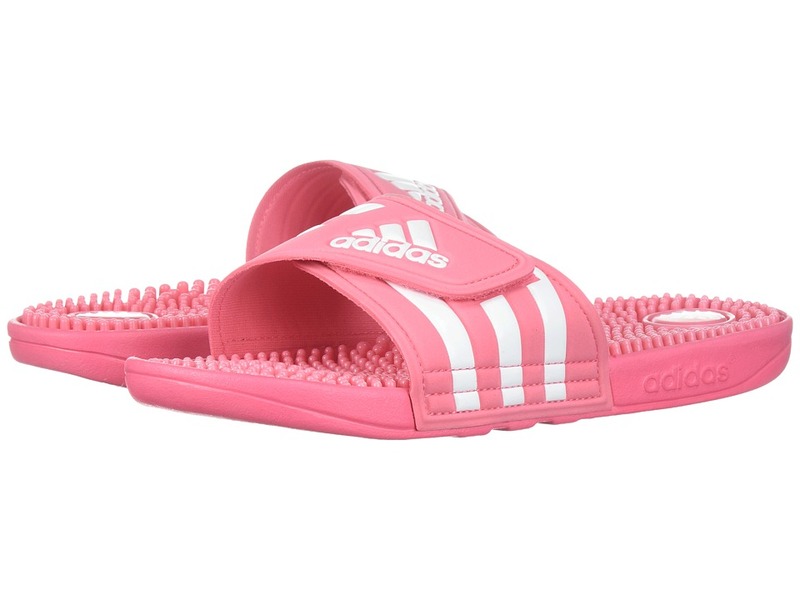 The adissage from adidas is a dependable, post-workout slide for the active woman! Adjustable PU strap for a custom secure fit. Hook-and-loop closure. 3-Stripes branding. EVA outsole, with massage nubs footbed. Polyurethane sole for great all-day traction. Imported. Measurements: Weight: 6 oz Product measurements were taken using size 5, width B - Medium. Please note that measurements may vary by size. Weight of footwear is based on single item, not the pair. Traditional soccer designs are the face of the Classic range, a line that sets the standards of today~s soccer product with the same technologies and material that have been soccer player favorites for decades. Durable kangaroo leather upper. Cushioned collar for comfort. Lace-up closure for optimal fit. 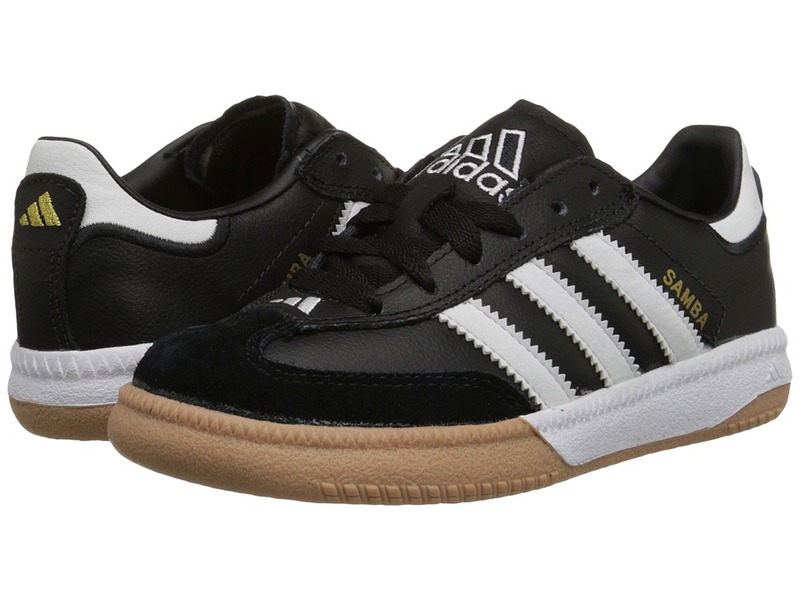 Signature 3-Stripes logo on sides with Copa Mundial callout on lateral side. Molded adidas callout on heel. Smooth synthetic lining. Lightly padded footbed for added comfort and support. Direct-injected PU outsole with molded studs for use firm ground. Imported. Weight of footwear is based on single item, not the pair. A new material update for the Classic Forum lo, now with suede overlays and canvas underlays. It still features a hook-and-loop ankle strap and molded external heel counter. A great addition to any wardrobe! Measurements: Weight: 15 oz Product measurements were taken using size 11, width D - Medium. Please note that measurements may vary by size. Weight of footwear is based on single item, not the pair. After you give your all on the field, let the adidas Adissage K Core give your feet the comfort that they deserve. Basic open toe slide. Single band PU upper is an adjustable hook-and-loop flap for a custom secure fit. 3-Stripes branding. EVA midsole for lightweight cushioning. Footbed has massaging nubs to keep your feet feeling great. Polyurethane sole with flex grooves. Measurements: Weight: 4 oz Product measurements were taken using size 11 Little Kid, width M. Please note that measurements may vary by size. Weight of footwear is based on single item, not the pair. 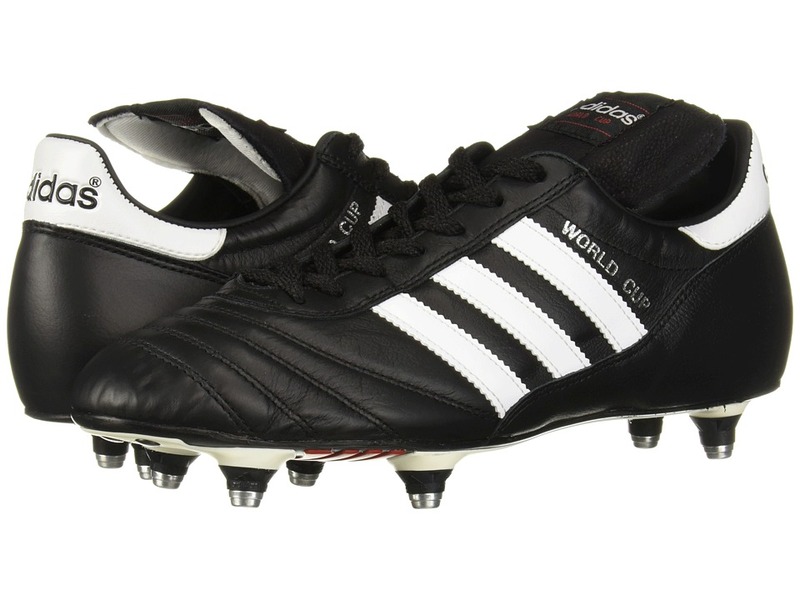 Bring the heat to the pitch in the adidas World Cup Leather SG soccer cleat. 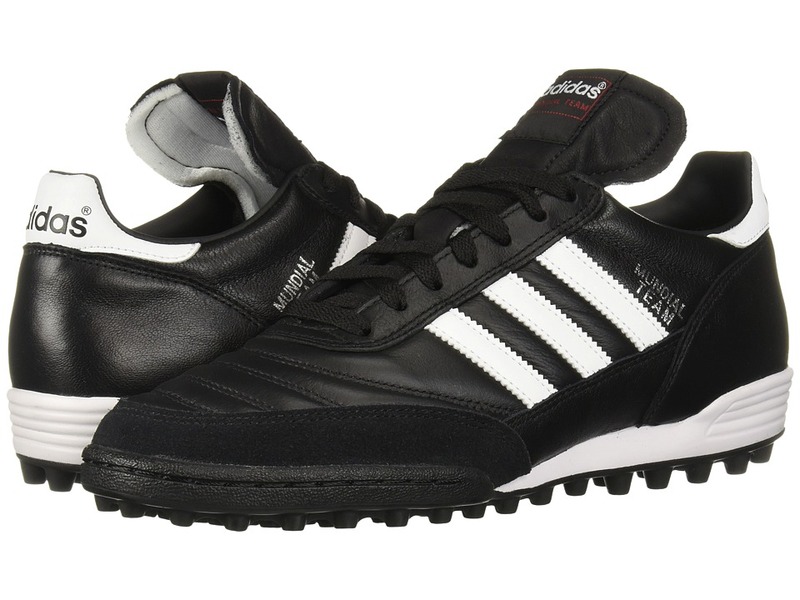 Kangaroo leather upper provides excellent ball feel and fit. Lace-up closure. Pre-molded heel counter helps lock the foot in place. Textile lining offers a great next-to-foot feel. Triple-density outsole. Screw-in, aluminum-tipped studs deliver grip on very soft, natural surfaces. Imported. Measurements: Weight: 8 oz Product measurements were taken using size 6, width D - Medium. Please note that measurements may vary by size. Weight of footwear is based on single item, not the pair. 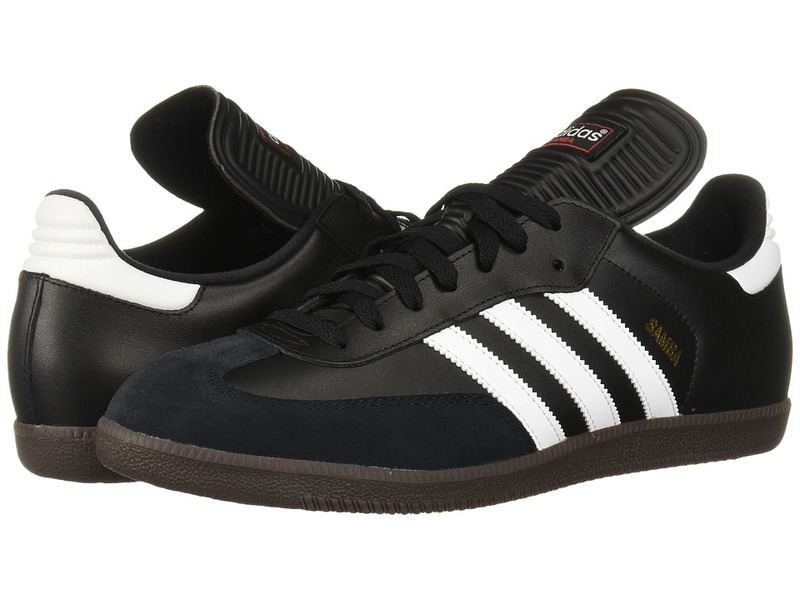 A dependable adidas basic. 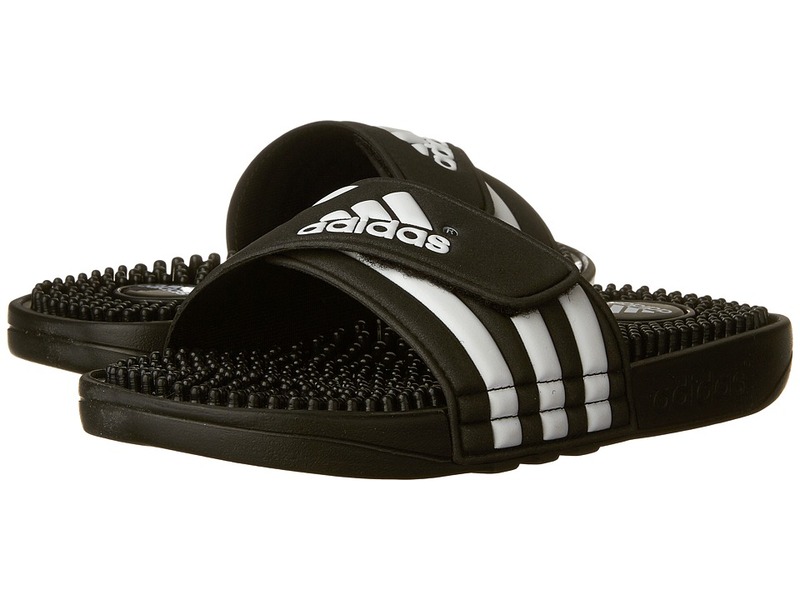 The adissage slide is a must-have for any casual outfit! Adjustable PU strap for a custom secure fit. Hook-and-loop closure. 3-Stripes branding. EVA footbed with massage nubs provides superior comfort with every step. Polyurethane outsole for traction. Imported. Measurements: Weight: 7 oz Product measurements were taken using size Men~s 9, Women~s 10, width Medium. Please note that measurements may vary by size. Weight of footwear is based on single item, not the pair. 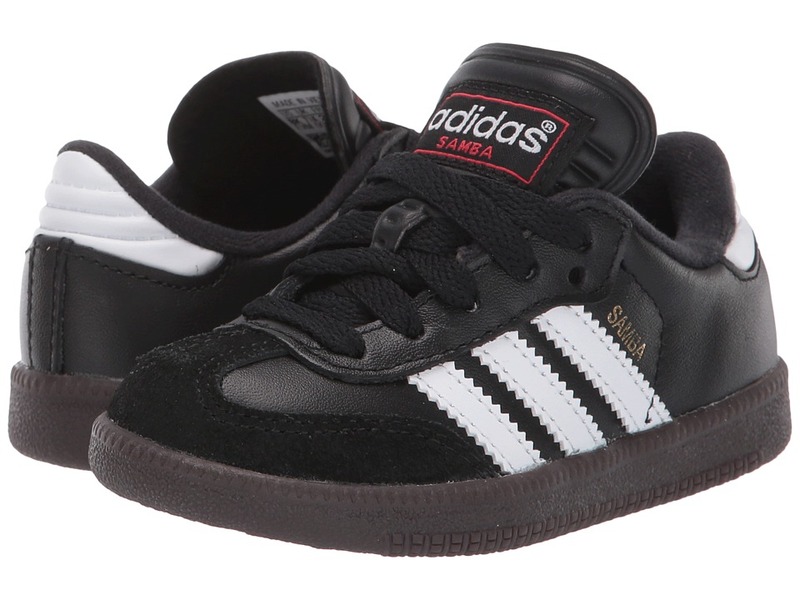 The adidas Kids Samba Millennium Core is a kids~ indoor performance shoe perfect for the junior soccer athlete! Full-grain leather upper for comfort and a soft feel. Fabric lining for a great feel in shoe. EVA insole for comfort. Die-cut EVA for lightweight comfort midsole. Non-marking outsole for use on polished indoor surfaces. Lace closure for a snug fit. Imported. Measurements: Weight: 3 oz Product measurements were taken using size 5 Toddler, width M. Please note that measurements may vary by size. Weight of footwear is based on single item, not the pair. The legendary indoor shoe will take your game to the next level. Full grain leather upper with brushed nylon quarter lining and half-molded tongue. Lace-up closure provides a snug fit. Soft textile lining feels great on your feet. Low-profile gum rubber outsole gives the elite player ultimate control. Full rubber shell sole with indoor sole tread. Measurements: Weight: 7 oz Product measurements were taken using size 12 Little Kid, width M. Please note that measurements may vary by size. Weight of footwear is based on single item, not the pair. Sometimes you have to go with the classics! Durable synthetic and leather upper for comfort and soft feel. Lace-up closure for snug fit. Textile lining. EVA insole for comfort. Die-cut EVA midsole for lightweight comfort. Rubber outsole for durability and comfort. Imported. Measurements: Weight: 10 oz Product measurements were taken using size 5 Big Kid, width M. Please note that measurements may vary by size. Weight of footwear is based on single item, not the pair. 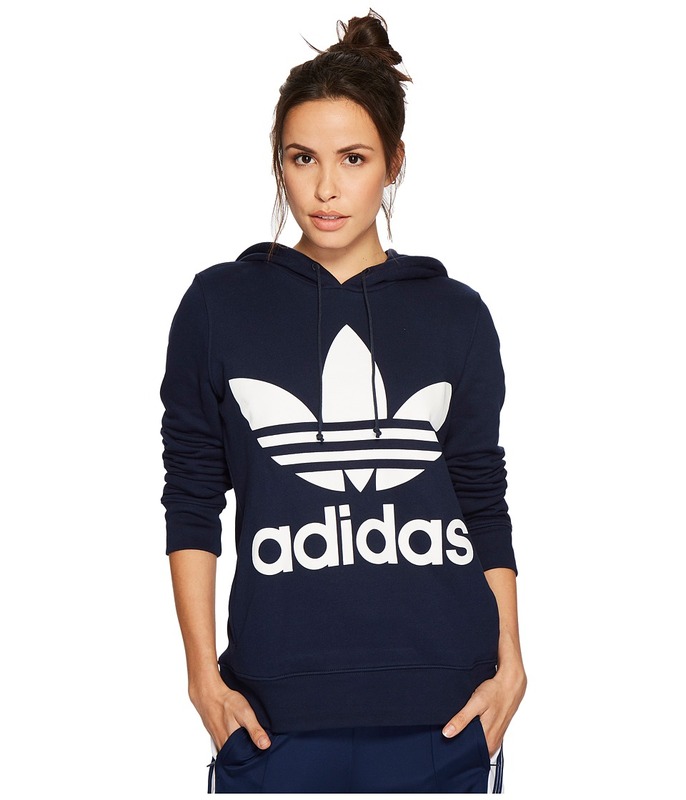 A streetwear essential, the classic Trefoil Hoodie epitomizes athletic cool. Attached oversize hood with adjustable drawstring. Pullover construction. Kangaroo pocket. Rib knit cuffs and hemline. Oversize brandmark screenprint across front. 70 percent cotton, 30 percent polyester fleece. Machine wash cold, tumble dry low. Imported. Measurements: Length: 32 in Product measurements were taken using size XL. Please note that measurements may vary by size. A classic from adidas refreshed in new seasonal colors. Attached hood with drawstring ties for a personal fit. Long sleeves with ribbed cuffs. Large Trefoil branding on the front along with kangaroo pouch. Pullover style. Ribbed bottom hem. 70 percent cotton, 30 percent polyester fleece. Hand wash cold, line dry. Imported. Measurements: Length: 25 in Product measurements were taken using size XS. Please note that measurements may vary by size. 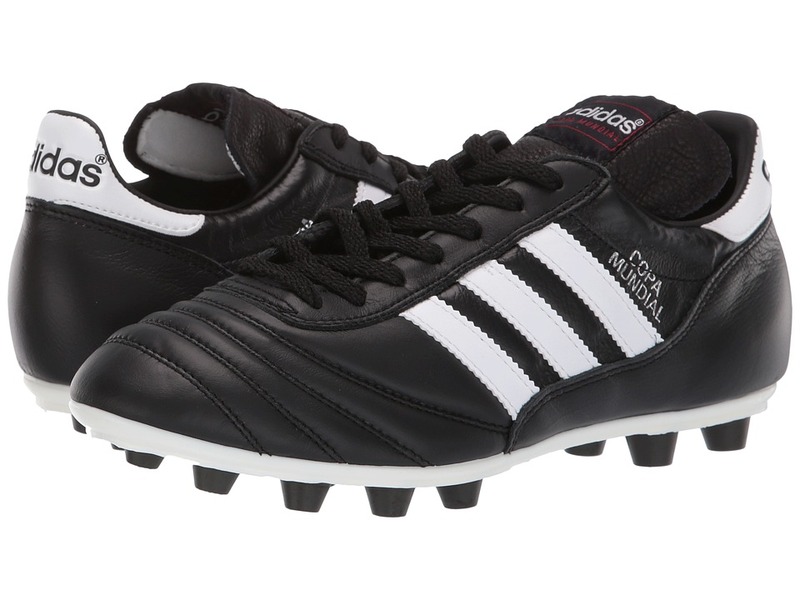 Classic styling offers up athletic performance in the adidas Mundial Team Leather TF soccer cleat. Kangaroo leather upper provides comfort and durability. Lace-up closure. Extended tongue promotes enhanced comfort. No-chafe heel counter for added comfort. Slightly padded tongue and collar. Dual-density, injection-molded polyurethane midsole. Multi-studded rubber outsole features a polyurethane wedge and stitched toe wall. Imported. Weight of footwear is based on single item, not the pair.